The wait is over! Thai version of Spin The World is out now! 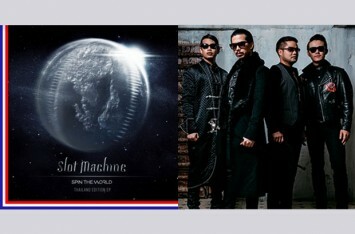 "“Spin The World (Thailand Edition EP)” "
After releasing their all-English album ‘Spin The World’, Slot Machine have chosen 6 songs from the album to translate to Thai language, with the lyric by lead singer Foet and co-producer Po Posayanukul. This album contains a variety of pulsating rock songs and sweet ballads, to please all music fans featuring Khon (I Know, I Know) with 24million views on Youtube, Yang Mueandoem (Say What You Want) and the latest single Mai Mi Khwam Rak (Sky Burning Stars) plus more.